One of the earliest definitions of the word ‘art’ means, ‘to join’. Public Art reinforces this by allowing me to interface aesthetics with ethics, simultaneously encouraging the appreciation of the creative process with community involvement. 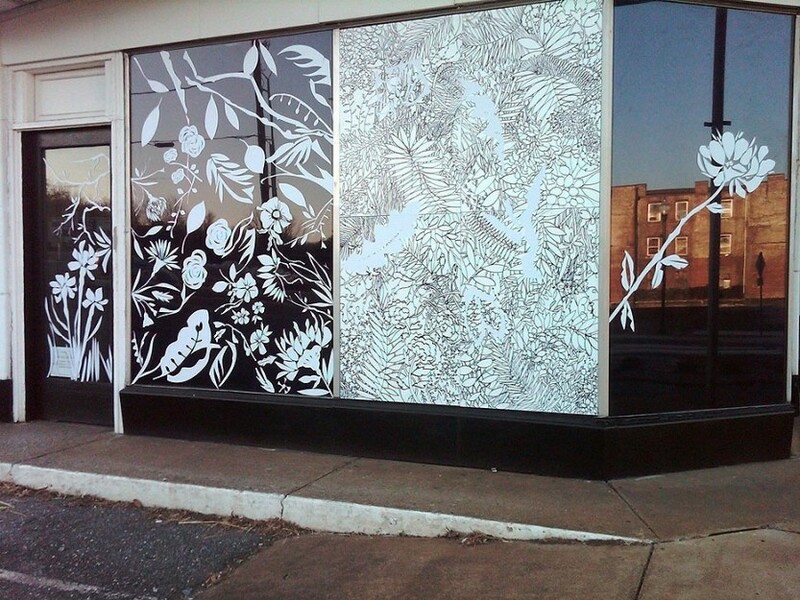 My path has been a seamless progression: Drawings to large-scale site-specific installations to Public Art projects. A current project involves using my artwork to transform an abandoned building and its site into useful, friendly and sustainable community areas. I am the sole artist. 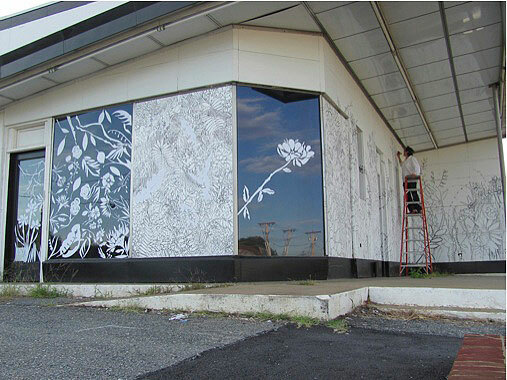 After seeing an exhibition of my work, Laura Dupuy, Director of the Lynchburg Neighborhood Foundation asked if I would volunteer to ‘do something with the windows’ of an abandoned service/gas station. When I saw the building and site, I responded positively, adding that I would also work on the entire building, and its surrounding paved parking lot. Anyone that passes by when I am working on the building greets me warmly. Young, old, infirmed, or carefree, some stop and talk. Some stop and watch. Many thank me: “I just wanted to come over and thank you for making the neighborhood beautiful. Extreme and unusual weather in southwestern Virginia has curtailed my progress. 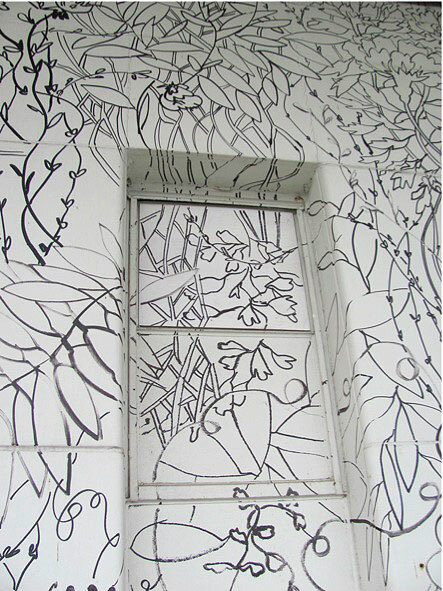 However, in a wonderful turn of events, the imaginary plants and flowers that I am drawing have become alive and real. A rain garden is now on the site of the former parking lot. The community has voted the building site to be the fulcrum for a sophisticated twenty-year plan. And the building itself will soon house “Word Works” a reading and writing program after school program for K-12 students in the area. These active, vibrant and sustaining solutions affirm my goals of community: art becomes, and is joined with, life. 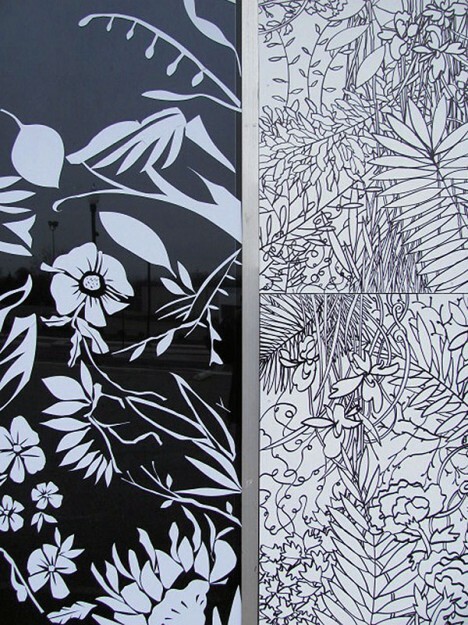 This project was the featured cover article in The Public Art Dialogue Journal, published by Routledge, November, 2011.